If debt collection calls are causing you stress, these tips could help you deal with them better. No matter how many times you’ve been contacted by a debt collection agency, the calls are never easy. The stress of being in debt can be too much to bear all by itself. But getting multiple collection calls every day could put you in an all-out panic. Debt collectors can be unpleasant or downright rude when they call you. And you may feel like you have little control over the situation when they call. But stressing over these calls or getting angry over the phone won’t make them go away. In fact, debt collectors might purposefully push you over the edge to get you to pay. So how can you keep your cool the next time a debt collector calls you? It can be hard to remain optimistic when you’re getting collection calls, but having a positive attitude could change the way you deal with debt stress. If you let a collection call ruin your day, you’re playing into the hand of the debt collector. But if you’re able to think of the situation as temporary, you may be able to handle the call better. Remind yourself that you will get through this rough patch, and you may be able to handle the stress a little more easily. Being ready ahead of time can help reduce your stress when a debt collector calls. One practical way to prepare for the call is to save the debt collector’s number into your phone so that you know who is calling. It’s also important to think about what a debt collector has said to you in the past, and how you would have responded to it if you were cool, calm, and collected. A lot of the time, debt collectors try to catch you off guard. Preparing your responses in advance could counter their aggressive tactics and put you back in control. Explain that you are unable pay them right now but will make sure they are paid. Don’t offer too many details on why you can’t pay them right now. It’s none of their business, and they could use those details to try to get you to commit to a payment. Dealing with debt collection calls? Discover 7 important facts you should know about debt collection agencies. When you’re on the phone with a debt collector, don’t forget to breathe. If they ask you a question you don’t know how to respond to, pause and collect your thoughts before answering. Try to control of the pace of the conversation by responding when you’re ready so you don’t feel overwhelmed. Sometimes they purposefully create awkward silence to trick you into filling the silence and give them details they can use against you. If a debt collector is making you frustrated, angry, or stressed out—hang up. Tell them they can call you later, once you’ve had time to think. Take some time to decompress, gather your thoughts, and prepare. Until you are ready to talk to them again, ignore the calls. Don’t pick up the phone from a number you don’t recognize. Remember that when a debt collector calls, you don’t have to answer. In fact, if you are angry or stressed, answering the call could be worse than ignoring it. After walking away from the situation and clearing your mind, you may be able to handle the call more easily. You may underestimate how important it is to take care of yourself when you’re stressed out—but it could make a huge difference in the way you approach a stressful situation. If you’re dealing with debt stress and you don’t take time to relax, you could end up suffering from anxiety, depression, or a feeling of helplessness. Stress could affect your sleep, your outlook on life, and your relationships with the people you love. Taking time to do something for yourself could reduce your stress. Whether it’s exercising, spending time with loved ones, reading a book, or watching TV, taking your mind off of the calls could help you handle your stress better. The stress of constant collection calls and the feeling that you are stuck in a never-ending cycle of debt can push you over the edge—especially if you don’t see any way of putting your debt behind you. So if you’re struggling with debt that you can’t pay off and the collection calls are too much to bear, it might be time to get professional help. Learn how to get out of credit card debt here. 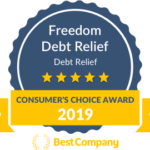 Freedom Debt Relief could help you relieve debt-related stress by providing you with a plan to get out of debt in as little as 24-48 months. * With the tools and resources available to all our clients, our program is designed help with the stress of collection calls. Learn more about how our program works and start relieving your debt stress today.